Learn how to use ASP commands in Dreamweaver to modify a database and add and run a stored procedure. An ASP command object is a server object that performs some operation on a database. The object can contain any valid SQL statement, including one that returns a recordset, or one that inserts, updates, or deletes records in a database. A command object can alter the structure of a database if the SQL statement adds or deletes a column in a table. You can also use a command object to run a stored procedure in a database. If you know the command will be executed more than a few times, having a single compiled version of the object can make database operations more efficient. Not all database providers support prepared commands. If your database does not support it, it might return an error when you set this property to true. It might even ignore the request to prepare the command and set the Prepared property to false. A command object is created by scripts on an ASP page, but Dreamweaver lets you create command objects without writing a line of ASP code. You can use Dreamweaver to create ASP command objects that insert, update, or delete records in a database. You supply the command object with the SQL statement or stored procedure that performs the operation on the database. In Dreamweaver, open the ASP page that will run the command. Open the Server Behaviors panel (Window > Server Behaviors), click the Plus (+) button, and select Command. Enter a name for the command, select a connection to the database that contains the records you want to edit, and select the editing operation that you want the command to perform—Insert, Update, or Delete. For information on writing SQL statements that modify databases, consult a Transact‑SQL manual. Use the Variables area to define any SQL variables. Provide the name and run-time value. Specifying the type and size of each variable prevents injection attacks. The following example shows an Insert statement that contains three SQL variables. The values of these variables are provided by URL parameters passed to the page, as defined in the Run‑Time Value column of the Variables area. To get the Size value, use the Databases panel in Dreamweaver. Find your database in the Databases panel and expand it. Next, find the table you’re working with and expand it. The table lists the sizes for your fields. For example, it might say ADDRESS (WChar 50). In this example, 50 is the size. You can also find the size in your database application. Numeric, Boolean and date/time data types always use -1 as the size. For more information on the type and size of SQL variables, see www.adobe.com/go/4e6b330a. Dreamweaver inserts ASP code in your page that, when run on the server, creates a command that inserts, updates, or deletes records in the database. By default, the code sets the Prepared property of the Command object to true, which makes the application server reuse a single compiled version of the object every time the command is run. To change this setting, switch to Code view and change the Prepared property to false. Create a page with an HTML form so users can enter record data. In the HTML form, include three text fields (txtCity, txtAddress, and txtPhone) and a submit button. The form uses the GET method and submits the text field values to the page that contains your command. Although you can use server behaviors to build pages that modify databases, you can also use database manipulation objects such as stored procedures or ASP command objects to build the pages. A stored procedure is a reusable database item that performs some operation on the database. A stored procedure contains SQL code that can, among other things, insert, update, or delete records. Stored procedures can also alter the structure of the database itself. For example, you can use a stored procedure to add a table column or even delete a table. A stored procedure can also call another stored procedure, as well as accept input parameters and return multiple values to the calling procedure in the form of output parameters. A stored procedure is reusable in the sense that you can reuse a single compiled version of the procedure to execute a database operation a number of times. If you know a database task will be executed more than a few times—or the same task will be executed by different applications—using a stored procedure to execute that task can make database operations more efficient. MySQL and Microsoft Access databases do not support stored procedures. You can use a stored procedure to modify a database. A stored procedure is a reusable database item that performs some operation on the database. Before you use a stored procedure to modify a database, make sure the stored procedure contains SQL that modifies the database in some way. To create and store one in your database, consult your database documentation and a good Transact-SQL manual. In Dreamweaver, open the page that will run the stored procedure. In the Bindings panel (Window > Bindings), click the Plus (+) button, and then select Stored Procedure. 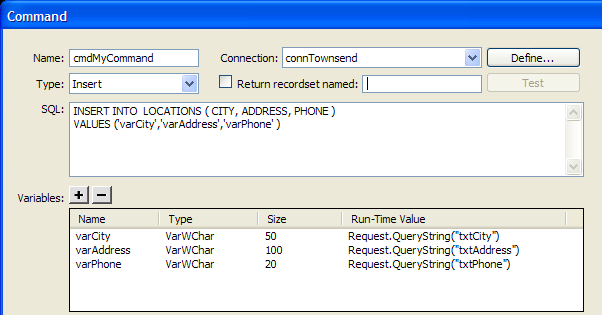 In the Data Source pop‑up menu, select a connection to the database containing the stored procedure. Enter the ColdFusion Data Source user name and password. Select a stored procedure from the Procedures pop‑up menu. Dreamweaver automatically fills in any parameters. Select a parameter, and click Edit if you have to make changes. The Edit Stored Procedure Variable dialog box appears. The name of the variable you are editing appears in the Name box. You must enter test values for any stored procedure input parameters. Select a Direction from the pop‑up menu. A stored procedure might have input values, output values, or both input and output values. Select a SQL type from the pop‑up menu. Enter a return variable, a run-time value, and a test value. If the stored procedure takes a parameter, click the Plus (+) button to add a page parameter. You must enter corresponding page parameters for each stored procedure parameter return value. Do not add page parameters unless there is a corresponding return value. Click the Plus (+) button again to add another page parameter, if necessary. Select a page parameter, and click the Minus (-) button to delete the parameter if necessary or click Edit to make changes to the parameter. Select the Returns Recordset Named option, and then enter a name for the recordset; if the stored procedure returns a recordset, click the Test button to see the recordset that the stored procedure returns. Dreamweaver runs the stored procedure and displays the recordset, if any. If the stored procedure returns a recordset and takes parameters, you must enter a value in the Default Value column in the Variables box to test the stored procedure. You can use different test values to generate different recordsets. To change test values, click the Edit button for Parameter, and change the test value, or click the Edit button for Page Parameter and change the default value. Select the Returns Status Code Named option, enter a name for the status code, if the stored procedure returns a status code return value. Click OK.
After you close the box, Dreamweaver inserts ColdFusion code in your page that calls a stored procedure in the database, when the code runs on the server. The stored procedure in turn performs a database operation, such as inserting a record. If the stored procedure takes parameters, you can create a page that gathers the parameter values and submits them to the page with the stored procedure. For example, you may create a page that uses URL parameters or an HTML form to gather parameter values from users. With ASP pages, you must add a command object to a page to run a stored procedure. For more information on command objects, see About ASP command objects. In the Bindings panel (Window > Bindings), click the Plus (+) button, and then select Command (Stored Procedure). The Command dialog box appears. Enter a name for the command, select a connection to the database containing the stored procedure, and then select Stored Procedure from the Type pop‑up menu. Select your stored procedure by expanding the Stored Procedures branch in the Database Items box, selecting the stored procedure from the list, and clicking the Procedure button. Enter any required parameters in the Variables table. You don’t need to enter any parameters for any RETURN_VALUE variable. After you close the dialog box, ASP code is inserted in your page. When the code runs on the server, the code creates a command object that runs a stored procedure in the database. The stored procedure in turn performs a database operation, such as inserting a record. By default, the code sets the Prepared property of the Command object to true, which makes the application server reuse a single compiled version of the object every time the stored procedure is run. If you know the command will be executed more than a few times, having a single compiled version of the object can improve the efficiency of database operations. However, if the command will only be executed one or two times, using one might actually slow down your web application because the system has to pause to compile the command. To change the setting, switch to Code view and change the Prepared property to false. Not all database providers support prepared commands. If your database does not support it, you might get an error message when you run the page. Switch to Code view and change the Prepared property to false. If the stored procedure takes parameters, you might create a page that gathers the parameter values and submits them to the page with the stored procedure. For example, you may create a page that uses URL parameters or an HTML form to gather parameter values from users.